Compatible with Fitbit Ionic. Allows full access to touchscreen, buttons, and ports. Not compatible with Fitbit Blaze. Durable, high grade Polycarbonate and a soft Thermoplastic Polyurethane provide superior shock-absorption. Elevated front bezel prevents damage to screen. Designed with device defense and style in mind, the Unicorn Beetle Pro series is the perfect choice for your Fitbit Ionic. This case features a rugged TPU bumper and wristband that safeguards against scratches, scuffs and blemishes. Made specifically with the Fitbit Ionic in mind, the UB Pro won't interfere with any features, buttons or overall functionality of the device. 1x SUPCASE Unicorn Beetle PRO Rugged Protective Case for Fitbit Ionic." Compatible with Fitbit Ionic. 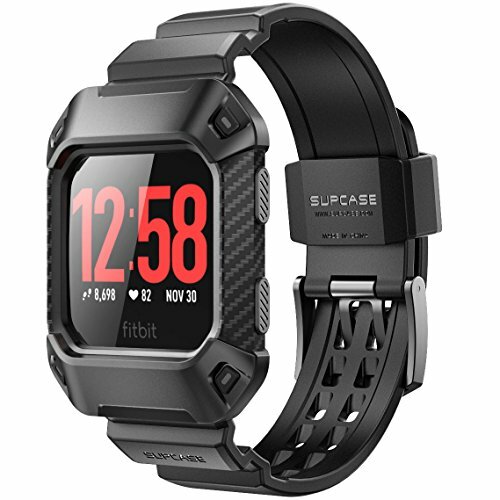 Not compatible with Fitbit Blaze.